Let them eat sheet cake. 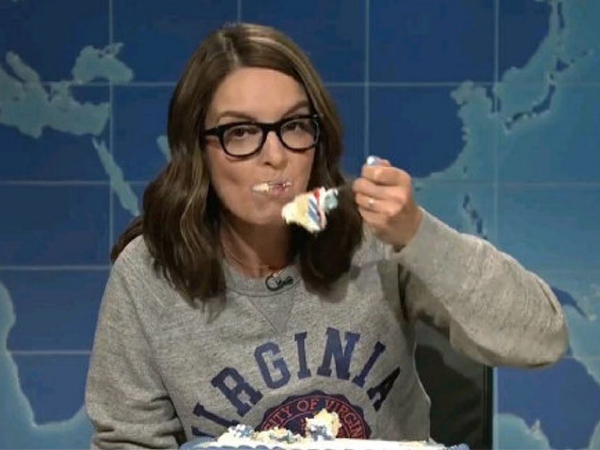 It's easy to understand why there was such a positive response to Tina Fey's "Weekend Update" appearance this week, in which she introduced "sheet-caking" as a reaction to our country's sudden Nazi problem. Fey has always been a paragon of rational liberal humor, and it was nice to see someone so famous get unapologetically angry with the state of our country. But Fey's glib decision to ignore white supremacy is the epitome of white privilege and white feminism, and in fact is the latest example of Fey's refusal to show up for anyone not white, cisgender and upper class. It's Marie Antoinette all over again. The mentality of 'just ignore it until it goes away' is a uniquely white, cishetero response to conflict. People of color, trans people, queer people, and poor people understand that 'just ignoring it' is not a realistic way to live your life when you're oppressed, because the world simply won't let you. When your skin/gender/sexuality/class is the very thing that makes people hate you, when just walking into a room is enough to incite anger or violence, when you're subjected to intolerance on a daily basis, ignoring it just doesn't cut it — no matter how much cake you have to stuff your face with. Sure, it's nice to think that we as a nation could collectively decide to simply ignore white supremacists. That the press would just not show up to their rallies, and these angry white babies with tiki torches would be shouting their hatred into the empty air. But that isn't going to happen, that's simply not the world we live in, so to let their hatred go unopposed is something only those that hatred isn't directed at can do. I recently tried to rewatch some old episodes of 30 Rock and let me tell you, it's incredible how poorly the show has aged in less than 10 years. Fey's dogged commitment to being politically incorrect doesn't come off as edgy and incisive, it's just offensive — the only exception is Jane Krakowski's Jenna Maroney, who was always just a glorious monster. There is hardly an episode that goes by without a joke that belittles people of color, trans people, poor people, or anyone who isn't white and middle-to-upper class. Fey proved that she's still out of touch when it comes to questionable humor with her joke on "Weekend Update" that she hoped white supremacists in New York would get beat up by “a bunch of drag queens. ‘Cause you know a drag queen still is? A six-foot-four black man.” Why is it still ok to make jokes about black men being pre-disposed to violence? It's not. "Drag queens will beat you up because drag queens are black men and we all know that black men will beat you up." Racism isn't going anywhere. America is a country that is structurally racist, and we can't keep telling ourselves that being the bigger person — or trumping hate with love — are going to magically make this country a better place. We have to actually combat racism, and that means white people physically putting our bodies on the front lines, dismantling our own socially-conditioned racism, opposing racism in our own families and social circles. It doesn't mean sticking our heads in the sand — or a sheet cake — until racism magically disappears.